Coonoor is an innovative consultant and trainer. Her company is a creative consultancy that helps businesses and organizations get better results with creative methods. Coonoor believes insights drive results and the best insights come from people - your team and your customers. Through Design Thinking, Organizational Improv, and Innovation Facilitation, Coonoor helps organizations of all kinds solve complex business problems, boost customer value, and improve team performance. Her customized experiences mobilize teams to spur collective creativity, innovation, and above all – actionable results. Coonoor works across sectors and industries with organizations as varied as Capital One, Deloitte, YWCA, Starbucks, Microsoft, the Inter-American Development Bank, and the Pentagon. Coonoor honed her creative problem-solving skills during her years as a strategy and innovation consultant at Deloitte Consulting, where she was awarded the prestigious GovLab Innovation Fellowship. 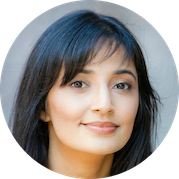 She is a graduate of Adaptive Path’s User Experience intensive and has studied product design at Wharton School of Business. She is certified in Creative Facilitation & Design by Retreats That Work. She has been a regular guest speaker on “Improvisational Mindsets for Leadership” at the George Washington University School of Business. Coonoor has a BA from New York University and an MA from The University of Chicago. Coonoor has been an improv comedy performer, teacher, and coach for nearly 10 years, having studied with many of the modern greats in Chicago, New York, Los Angeles, and Washington DC. After living in many major American cities, Coonoor now calls Seattle home and enjoys being a part of the improv community there and loving on her Bernese Mountain Dog puppy, Nikka.